If you’re looking for a Bethnal Green house clearance firm then Away With It is a company you can rely on. With our base in Essex, we are just down the road and can often offer same-day quotes and even collection if it suits you. Fully licensed and insured, if you need your house clearing we think you’ll be pleasantly surprised with the “Away With It experience”. When it comes to any household services, we know that trying to fit them in around your busy life can be stressful. Also, who really wants to take annual leave from work to clear the attic? We don’t! And, that’s why we are fully aware of the importance of providing a service when it suits you. This is why our operatives offer quotes and services seven days a week, between 7am and 11:30pm. As a result no matter what your other commitments might be we can fit around you. Furthermore, with Away With It you won’t spend all day waiting around waiting for us to turn up. Instead we’ll agree a guaranteed time with you in advance, and always turn up when we promise. So even if you’re juggling a family, a career and more, Away With It can get your house cleared when it suits you. Even better, our team will give you a call when they are on their way to your property, just to give you a specific time of arrival. Of course, it’s not just our flexibility which makes us special. Our dedicated team also put a huge emphasis on customer service, and ensuring we only leave when you’re happy with the job that has been done. 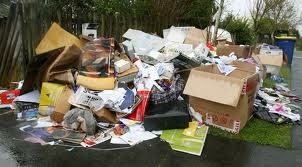 We also know that you don’t want to spend a fortune on house clearance. This is why we will always give you the best possible price. We charge by ‘load’ and your quote will reflect the exact volume of waste we remove. Why should you pay for an entire van when you only took up a tiny fraction of it? Therefore, you’ll often find our house clearance services far more cost-effective than competing firms. Away With It are a fully-licensed waste carrier which means you can feel confident that the items cleared from your property will be dealt with in a legal and professional manner. Best of all, we put a huge emphasis on running a green business and we recycle 80% of the waste that we remove. You can then rest assured that you’re doing your bit for the planet whilst having your property cleared. Another aspect of Away With It that makes us stand out from the rest are the friendly and hard-working team members. Whether via the phone or in person, you will always come first and be given the highest level of customer care. Whether you’re just looking to clear out some unwanted junk, or you have a whole property that needs clearing, why not contact our friendly team today to find out more? No job is too big or too small for the Away With It team. We’ll arrange a time that’s right for you in order to give you a quote. Then, if you like the price (we’re sure you will) we can then arrange to get your house cleared as soon as possible. All quotes are without obligation, so to get yours – or to find out more about how we work give us a ring on 0208 504 7390 or 07957 123019 to discuss your needs for house clearance Bethnal Green. We are here to take your call 7 days a week from 7am to 11.30pm.